Q. Which web marketing best practices has Google suddenly made into rules? 2017 was full of surprises; 2018’s already a shocker! A. If you haven’t redone your website to have responsive pages, set up AMP for your mobile pages, and made sure every single file on your website conforms to the HTTPS:// protocol, Google may stop showing your pages in their search results on Chrome, and/or your ads in AdWords. Hey, no worries… Chrome only has a 61.4% market share. Over the holidays, we thought several times about how to alert clients, past and present, about the pressing need to revisit every aspect of their website. We wanted to sound the alarm: this alert is not a drill. Other search marketing companies use fear and uncertainty, robocalling every business in the country. That’s not us. Still, you need to hear this: 2018 is the time for all site owners to be doing some serious spring housecleaning. Since the full rollout of Google’s AI-based ranking algorithm, RankBrain, in 2017, the rules of engagement for SEO have changed. Our strategies have moved toward long-form writing, mapping content to search intent, and integrating a much wider range of the search terms client prospects are using. That’s all good…through 50 different major “algorithm changes” over the years, our clients have never gotten dinged or penalized, because we have always focused on quality content (which is what Google is looking for). Already this year, so much has changed so rapidly, we could be emailing clients every other week about some Google news or rumors, explaining that the sky really is falling, bit by bit. What’s happening with voice search? Are the majority of your prospects on mobile devices? Are your pages loading quickly enough? Why do people come to the site, just to leave in a few seconds? If there’s anything we know is absolutely true, unless you’re already thinking about redesigning your site, you’re going to want to keep things the way they are…and not worry about these “what ifs?” and hard questions about web performance. A major web redesign project is a big deal, and it distracts you from the day-to-day work of building your business and selling new clients…for months. Even making copy changes means revisiting the home page turf wars everyone remembers… Sure, we understand, complacency is comfortable; change is not. Plus, it’s an unbudgeted expense, and maybe a big one. But what if you and your team understood all the options, and could agree to prioritize on the most important changes? Look what just came in our mailbox! 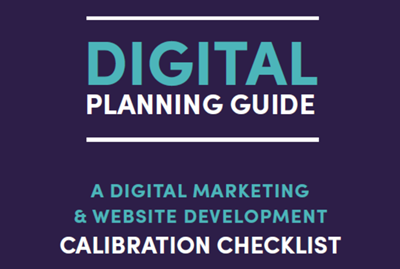 A complete step-by-step planning guide for revisiting and refreshing your website and search marketing strategy. What’s great about design firms is they can always manage to surpass your expectations. I would have sent out a few emails, and of course they would be informative, but not nearly comprehensive. White Lion is one of our design/development partners which has been referring clients to us since 2004. While most of our new business comes from referral, it’s remarkable that this business relationship has been so enduring…and this is a good time for us to give them a marketing boost. Why not? They’ve covered all the bases, and they’re smart enough to know most clients can’t bite off a 99-point checklist and execute the work. 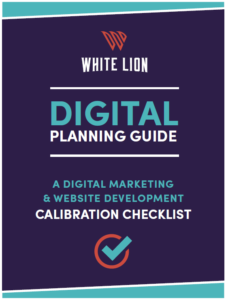 When I looked at this resource, and the series of posts which break up the Digital Planning Guide into smaller, more digestible chunks, I asked White Lion if we could share the entire set of resources with our clients, friends and prospects. Today’s post is a shortcut to downloading the whole Guide…as a specialized search marketing agency, it’s very rare we can refer a client to a design firm: we’re what comes AFTER websites are designed, developed and posted. And if a really smart client wants to think through their marketing strategy before they start on redesign, it’ll typically be the design firm which puts us in touch.